PALESTINIAN ORGANISATION HAMAS has softened its stance on Israel for the first time in years. For many years Hamas has called for the Israeli state’s destruction. The easing of its stance could be seen as an attempt on its part to improve its diplomatic standing internationally with Donald Trump set to meet with Palestinian leader Mahmud Abbas next week. Deep divisions remain between Hamas and the Palestinian leadership. The eased stance towards Israel is contained within a new policy document unveiled at a press conference today. The document was launched in the Qatari capital Doha by exiled Hamas leader Khaled Meshaal, who is due to step down soon after serving his maximum two terms. The conference was also broadcast live in the Gaza Strip, the Palestinian enclave controlled by Hamas, while the document itself has been posted on the movement’s website. “We in Hamas believe that renewal and reinvention is a necessity,” Meshaal said at the conference in a Doha hotel. While the new document does not amount to recognition of Israel as demanded by the international community, Hamas officials say, it formally softens its stance in a few key areas. The document has not been especially well-received in Israel itself, with a spokesman for Israeli prime minister Benjamin Netanyahu saying “Hamas is attempting to fool the world but it will not succeed”. “They dig terror tunnels and have launched thousands upon thousands of missiles at Israeli civilians,” David Keyes said in a statement, referring to rockets fired from Gaza and tunnels used to carry out attacks. The strip has been under an Israeli blockade for 10 years. But after years of internal debate, the new document formally accepts the idea of a state in the territories occupied by Israel in the Six-Day War of 1967. It also says its struggle is not against Jews because of their religion but against Israel as an occupier. “We are not fighting against the Jews because they are Jewish,” said Meshaal. We are waging this struggle against the aggression of Zionists. However, the original 1988 charter will not be dropped, just supplemented, in a move some analysts see as a way of maintaining the backing of hardliners. Direct talks is “a process, it’s a game we will not fall for it”. The new document also continues to speak of liberating historic Palestine, including areas that are today part of Israel. 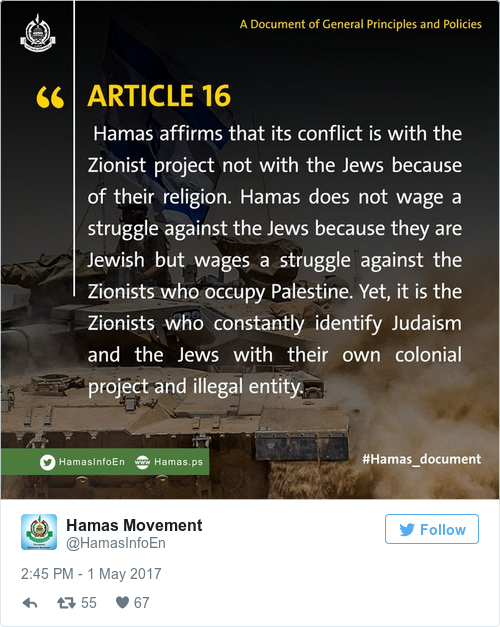 Hamas is considered a terrorist group by Israel, the United States and the European Union, and the new document is aimed in part at easing its international isolation. Next Post:Will Hollywood Learn Anything From Get Out’s Success?